Embroidered Floral Tops Just $24.99! Down From $80! Shipped! You are here: Home / Great Deals / Embroidered Floral Tops Just $24.99! Down From $80! Shipped! This deal is good until February 12 only! 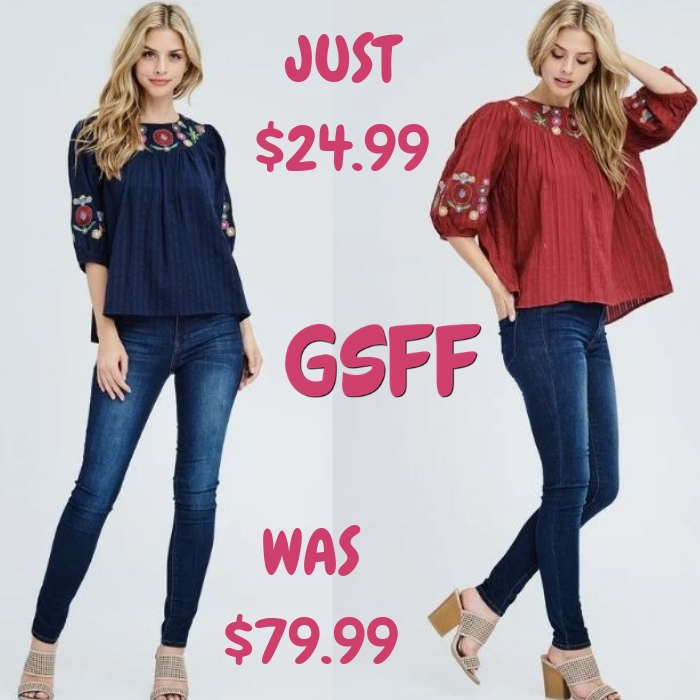 Jane is offering these Embroidered Floral Tops for just $24.99 down from $79.99 PLUS FREE shipping! You don’t want to miss this half-sleeve, loose fit top with floral embroidery. Sleeve cuff has some elasticity. Scallop detailed 3/4 sleeve top with floral embroidery. Shop these timeless tops that will complete any look this season. PLUS, enjoy FREE shipping!